Katie Ackerman is our board certified Women’s Health Nurse Practitioner. Katie obtained her Bachelor’sDegree in Nursing from the University of Texas Health Science Center at Houston in 2002. She began her nursing career in the Women’s Services unit at Memorial Hermann Hospital in the Texas Medical Center, where she worked for nine years. While there, she cared for obstetric patients as a labor and delivery nurse, as well as for women who were in the hospital postpartum or with antepartum complications. After deciding that she wanted to develop more long term relationships with her patients in order to help better impact their health, she went back to The University of Texas at Houston to become a Nurse Practitioner. While in school, Katie had clinical experiences at multiple women’s health clinics in Houston. During this time, she was able to broaden her clinical knowledge to include many of the gynecological conditions that she did not frequently see as an obstetric nurse. In December 2012, she graduated with her Master’s Degree in Nursing, again with Honors. She also received the MSN Faculty Award of Excellence. Subsequently, she obtained her board certification as a Women’s Health Nurse Practitioner. 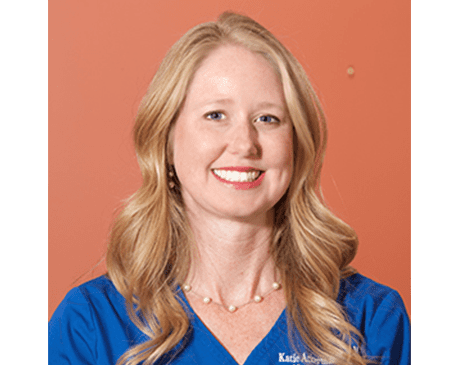 As a Nurse Practitioner, Katie is able to see pregnant patients,perform gynecologic exams (including well-woman exams), and see patients with urgent problems. She has been married to her high school sweetheart for over 15 years. When she is not at the office, Katie is a soccer mom to their son, Austin. She is an animal lover, and has a yellow lab and a calico cat. She enjoys her monthly book club, shopping and loves to travel. We accept most major insurance plans. Please contact us for more information.